COMMENTS - By now, we're used to the patient long-arc storytelling of high quality Netflix's dramas, but even by their standards, the new season of its flagship political thriller is a slow-burn. After a characteristically caustic and blatantly evil opening seen featuring the anti-hero President Francis Underwood, the focus shifts decidedly away to his sometime Director of Strategy Doug Stamper, recovering by his attack by Rachel Posner at the end of season two. I love how dark this gets, and Michael Kelly should be praised for his superb acting which steals the show from Kevin Spacey. His final scene in the episode is truly twisted and I'm very much looking forward to seeing where his character will go in this series. Elsewhere, the series continues pretty much as normal. Despite being President, the MO of Francis and his wife Claire is the same - caustic power-hungry manipulation. For a moment it feels like we might see a rift between them - and I'd truly LOVE to Underwood vs Underwood - but in the end they remain the deeply loyal power couple. So the pieces are in place for the season, but so far there's nothing too exciting at the White House. Overall, then, a cautious thumbs up for the season opener. Great psychological drama offset by a rather same-y political story. Much like FU's poll ratings, it's all to play for. Behind the lens, I loved the editing and sound editing depicting Doug Stamper's fragile mental state. The hissing white noise, the extreme close-ups all went to brilliantly depicting his trauma. 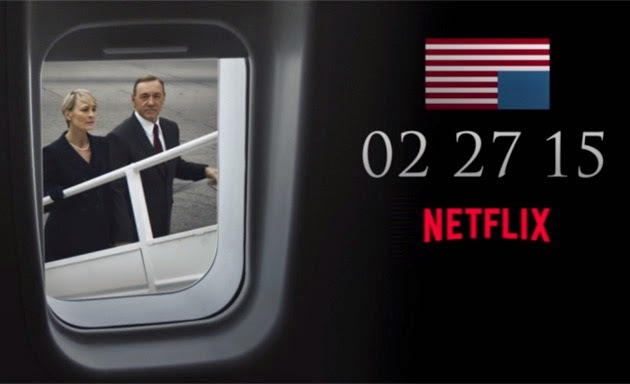 PLOT SUMMARY - President Francis Underwood (Kevin Spacey) literally pisses on his father's grave and boasts of how his funeral will be epic. FU's Labour bill plans to slash social security to fund a massive private sector job creation programme. A Supreme Court justice is retiring but FU begs him for more time as he can't face a nomination battle at the same time as pushing his bill through Congress. It emerges that Donald Tusk has accepted the Vice Presidency is exchange for a lavishly funded cancer research centre in honour of his late wife. Supreme Court Justice Jacobs tells the President he has early stages Alzheimers and wants to retire but FU begs him for more time. It emerges FU's Secretary of State warns FU that his wife is meddling and he cautions her on the timing of an as yet unmentioned ambitious move. But Claire pushes for a nomination in case FU doesn't win the upcoming Presidential election. In an homage of the Bin Laden assassination, FU takes Claire into a situation room where he gives authorisation for a drone attack on a terrorist target that will also hit civilians. Despite seeing the tough decisions, Claire still wants power, and FU will not deny her. Doug Stamper (Michael Kelly, despite Rachel Posner's best efforts, is still alive. Claire Underwood (Robin Wright) visits Stamper and is sycophantic. The Underwoods have prevented him being questioned by the police and it appears that he doesn't remember what happened and doesn't know what happened to Rachel. Gary Stamper (Kelly Aucoin) helps Doug settle back into his flat and he watches FU skewered on a TV interview. The next day Stamper meets FBI hacker Gavin Orsay (Jimmi Simpson) and calls for a crash meeting with FU. FU gently but firmly refuses to give Stamper work. Dejected, Stamper hires a prostitute and asks her to squirt bourbon from a syringe into his mouth. Slight error here, Donald Blithe not Tusk is the Vice President. Good catch! Thank you, kind Ser!